Being limited to the 2oz option was probably the hang-up. Many home mixers won’t buy that much unless they know they will use it a lot. A real lot! Great to see you guys are thinking of us! I’d like to sample anything creamy or desserty if you have something PG-free. I have the Heavy Cream and like it. I’d been hesitsnt to use it, though, because of the old 2oz minimum. besides the smaller size hangup, imo the prices are in more of a super concentrated flavor and not the higher TPAish % that i have heard about. Btw heavy cream is on the current debated list, thks for the input! PM sent, and thank you for the offer. Looks good @amovapeteam! I’ll have to give some a whirl. 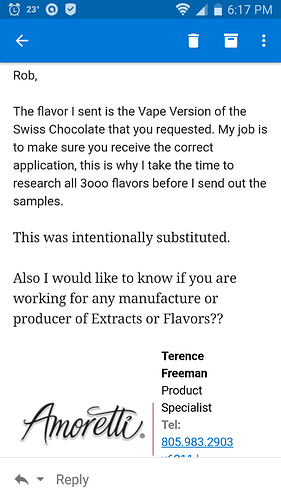 have 5 picked out and to help them i added the sku#, more then likely will help both them and yourself and not recv the wrong flavor. i usually dont like to think on a friday night but pumkin, pumpkin pie or pumkin pie sauce? Most flavors in my country are sold at 10ml (for the customers to try new flavors) and 30ml (if we use it much). Then it jumps to 4oz, 8oz and so on for wholesale. hopefully after 3 years they have more transparency and sorted out which vapeable product samples they will be sending out. 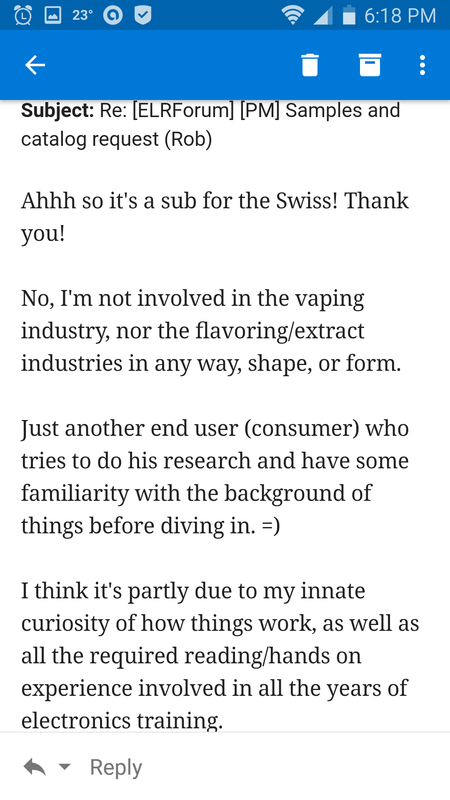 You would think so, but, my experience was such that while the rep I dealt with was VERY friendly, and quite accomodating , there was a noteworthy lack of product knowledge (at least IMO). To the point that I was even afraid to test some things, because of the fact. 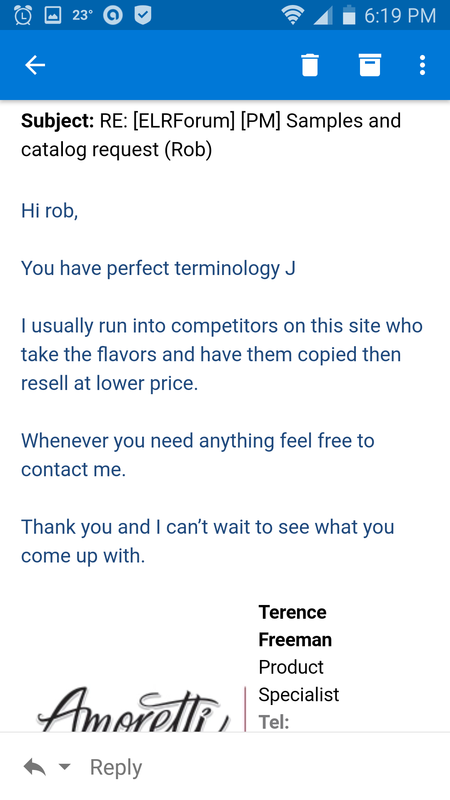 I informed them IN ADVANCE that I have PG issues, as well as inquired about the ‘appearing of oils’ (or at the very least separation) that was occuring after letting the flavors sit for two-three weeks after delivery (Yay for backlog in this case, because otherwise I would’nt have noticed!). To which point, a couple were mistakenly sent/ordered (not going into whose fault it was shipping vs rep.), and then at least one other used what I’ll call a “non-standard” carrier (which I’ll not divulge due to an understanding with the rep). 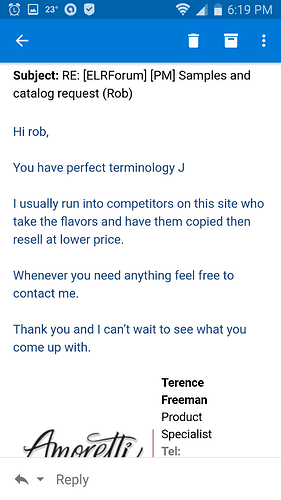 He initially had suspicions of me being an “industry insider” that was looking to decompile their offerings (which I’m sure happens more than we realize), thanks largely in part to my use of (for lack of better way to put this) proper terms that “normal mixers” don’t ordinarily use (I guess). 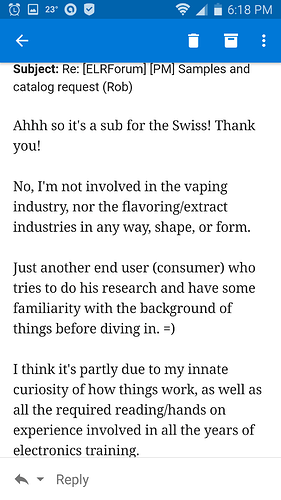 But after explaining that I AM NOT affiliated in any way/shape/form with any entity that makes/produces/sells e-liquid…he seemed to calm a bit, and gave further info into the carrier. Once I learned what was being actually used (and only AFTER I inquired mind you, which was MORE unsettling than not knowing initially)…I decided I was done with the experience, and at the very least that particular rep.
Tread cautiously people, and make sure to ASK if you have ANY doubts. To the rep’s credit (a year or so ago), he WAS honest when the rubber finally met the road. But it was “slick tires” some of the time in getting there. No ill will to Amoretti if they’re trying to get their act together and present a new effort to the community at large. But I do hope that no one experiences what I did previously. 15ml. is a bit much to buy for an unknown flavor trial. I would be more inclined to purchase 5ml sizes and larger sizes if they prove out. As I understand, NF is the only non PG vendor supplier at this time. Hope you consider a similar line. Thanks for the info brother; They just did not know who they were talking to did they? I think if they would have gotten to know the community and those of us that take it seriously they wouldn’t have poked the bear. We don’t call you Sprkslfly for nuttin. I would love to have more direct conversations with you, if you are up to it. But it certainly came across that way on my end. Anyways, I’d be happy to field whatever questions I can. Feel free to PM anytime.